It’s every homeowner’s dream to grow an even, attractive, and healthy lawn. In addition to being the perfect playground for children, it’s also ideal for holding overnight parties and other social events over the weekends. However, the biggest impediment to that dream is the unevenness caused by bumps, mole hills, and frost heaves. Besides mowing, edging, and fertilizing, the other remaining piece of the puzzle to a picturesque lawn is a lawn roller. The machine takes the time, frustration, and hard work away from leveling the surface, mowing, seeding, and sodding. Which is why it’s an indispensable tool for any homeowner who wants that green, lush, even lawn. The objective of this piece is to help homeowners and greenhorns pick out the most suitable lawn roller from a market awash with manifold models of different sizes and shapes. After hours spent analysing, comparing, and testing out several models, we finally have our top 10 picks. If you’re looking for a heavy-duty, high-performance, versatile and effective lawn roller to use around your property, let’s introduce you to the Brinly PRC-24BH. It's a high-end machine boasting beastly performance and comes with an impressive 28-gallon capacity drum. Filled to the brim, the lawn roller is still remarkably lightweight and easy to maneuvre, giving you quick and easy access to tight or hard-to-reach spots all around the yard or lawn. The construction quality is equally impressive and will enable you to confidently take on a wide range of activities including but not limited to erasing the damages done on the lawn by moles and frost heaves, levelling the soil, and flattening the sod. There’s no denying the Brinly PRC-24BH is an expertly balanced and versatile option. It features a sufficiently large 18 by 24-inch frame that comfortably accommodates up to 270 gallons of water, more than enough to ensure you work diligently and continuously on your lawn with minimal interruptions. A unique selling point is the effortless portability and maneuvrability. 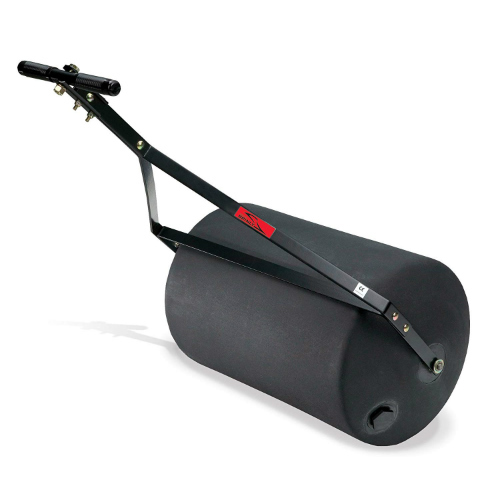 The heavy-duty poly roller drum comes with rounded roller end caps that turn smoothly and easily and won’t damage your lawn however long you work. A second impressive feature is a versatility that allows for towing or pushing. Even when it's full, the lawn roller gets around tight corners and other obstacles such as trees with outstanding ease and speed. The construction quality also stands out. The drum is of exceptional quality and offers great resistance to both rust and corrosion and can withstand loads of attrition. The handle features a comfortable grip and has a non-slip coating. Of course, you can just as well quickly hook it up to a tractor or riding lawn mower and save yourself some effort and time. The innovative design of the Brinly PRC-24BH makes it remarkably easy and quick to flatten your lawn. It's sturdy, easy to maneuvre, and cost-effective. Versatility, however, is its strongest selling point. An undisputable powerhouse, the Brinly PRT-48SBH takes the time and hard work away from keeping the lawn level and smooth by getting rid of unwanted bumps. The excellence of its performance is wholly attributable to its litany of outstanding features and specs. With a 54-gallon capacity and a 48-inch wide frame, it transforms an otherwise mundane and time-consuming project like rolling the lawn into a quick and enjoyable one. To add to its performance prowess is the fact that it features a heavy-duty and convenient scraper bar that ensure debris on the lawn or yard won’t be a bother when rolling. The rugged and robust construction with high-end materials less prone to denting makes it an ideal choice for levelling lawns and yards with the hardest and largest bumps. That's no mean feat especially for a cost-effective option, and the fact that the lawn roller pulls it off only confirms its sublime performance and excellent craftsmanship. Its effortless and effective performance is further reinforced by its 48-inch width and 54-gallon capacity, giving it the requisite practicality and heft for tackling large swaths of land in considerably fewer passes. Filled to the brim, it rolls quickly, easily, and effectively, helping you to neatly pack down newly sewn seed or sod. Specifically designed to be towed, it spares you the agony of pushing around some considerable weight, especially over some pretty steep bumps. It turns and maneuvres smoothly and easily without gouging your yard or destroying your flowers and small trees while the scraper bar stops yard debris from sticking on it. Emptying and filling it is just as easy and quick, thanks to the incorporation of a large diameter fill opening. And because it’s lightweight, storage is a breeze. One of the best and affordable options out there, the Brinly PRT-48SBH works quickly and effectively. It attaches easily to the tractor’s drivetrain and maneuvres just as easily. The tow-only design coupled with its heavy-duty, high-capacity 400-pound drum makes it a perfect choice for levelling mole tunnels. The rugged, durable construction of the drum guarantees that it'll continue providing you with several years of reliable and flawless performance. It's also easy to store in between uses while additional features such as the drain plug, poly scraper bar, and centre baffler considerably add to its awesomeness. To top it all off, you get a generous 36-month limited warranty to cover you against deficiencies in material and craftsmanship. Considered the poster child for exceptional performance, the Agri-Fab pulls no punches to provide you with the best performance. To ensure durability, the machine sports a commercial-grade, all-polyethylene construction and is further internally reinforced, which is another way of saying that in addition to being rust-resistant, the drum can withstand heavy, extreme use. As a result, the likelihood of it denting, cracking or breaking is minimal at best. It's on this account that it easily accommodates as much as 400 pounds of water or sand. With a diameter of 18 inches and a width of 36 inches, it easily and effectively flattens uneven grass and helps with levelling new soil. You'll be covering 36-inch swaths of the lawn or yard is fewer passes and more quickly compared to smaller models. Additional features include the 1-inch filling hole for quick filling and emptying of the drum and to prevent leaves, mud and other lawn debris from slowing you down, the lawn roller conveniently features a durable poly scraper bar while a centre baffler ensures superior stability. It comes with all the features a homeowner can possibly need from a roller. Beside the heavy-duty construction, the tool has a high water/sand holding capacity and hooks up pretty quickly to the tractor for easy and quick towing. Following closely on the heels of its bigger cousin is yet another Agri-Fab product – the Agri-Fab 45-0267. It easily continues the brand’s tradition of high-end performance, versatility, outstanding durability, and convenience. It’s considerably more cost-effective, though. You can elect to push it or hook it up to your riding mower or tractor, whichever option you’ll find most convenient. The small profile makes it a perfect choice for maneuvring around the many obstacles like trees that characterize most lawns. The machine is impressively versatile. The ingenious design allows you to choose among pulling, pushing, or towing it. For small-sized lawns, pulling or pushing is the best way to go. If on the other hand, you have to cover an extensive lawn within a short period of time and without expending too much effort, the fact that the lawn roller easily and quickly hooks up to a tractor's drivetrain is welcome news. It quickly and effectively flattens the roughest lawns with several bumps and takes the time and effort away from packing down newly sown seed or sod, thanks to a 250-pound weight drum. Considering it’s constructed with high-quality, smooth-finished plastic, it is guaranteed to provide with years of easy, trouble-free performance. The drum is not only resistant to rust and corrosion but will also ensure that cracks and dents are the least of your concerns, however rough the terrain. A professionally-designed channel bar strategically positioned on top of the roller keeps dirt and other debris from sticking to the drum. Predictably, the edges are both smooth and rounded to enhance maneuvrability and prevent the drum from inadvertently destroying or messing up your lawn. In all, if you need a reliable, high-performance optionr that performs consistently and evenly with minimal hiccups, Agri-Fab 45-0267 Push/Tow Lawn Roller would be it. The smooth, rust-resistant, and durable construction provides for years of flawless lawn rolling. Value-conscious users always have their ears and eyes out for cost-effective and high-performance products that offer great bang for the buck. If that statement describes you, then the Seymour option was designed with you in mind. An industry doyen, Seymour has a knack for pushing the boundaries on innovation, incessantly searching for new ways of making easier and better. Their option does exactly that. Its ingenious design will considerably simplify your life by taking the hard work, time, and frustration away from keeping your lawn neat, inviting, and healthy. Rolling a lawn is an onerous task and unless the device is made from the highest quality stands, it won’t stand the attendant loads of wear and tear for more than a 3 months. Built to withstand the test of time, it features high-end construction with first-rate gauge steel which, in addition to ensuring durability, offers great resilience and strength as well as resistance to rust and corrosion. The results will only get better with age, even as it approaches the tail end of its useful life. Construction quality aside, it invariably delivers heart-stopping performance, thanks to a slew of performance features. With dimensions of 14 by 36 inches and a remarkably wide width of 40 inches, the performance closely rivals that of other industry giants. Properly filled, it rolls efficiently and quickly, enabling to adequately each and every inch of the lawn. Boasting a 263-pound capacity, the drum comes with an adequate heft to give you the performance you've always dreamt of. As you would expect, both edges are rounded, meaning that they pose the least risk of damaging your lawn as you make sharp corners and maneuvres in tight and hard-to-reach spots. Likewise, it fills and empties with ease and is easy to store when empty. If you want an affordable, easy to tow or push option, we highly recommend you take another look at this device. Besides affordability, it also features a user-friendly design and solid performance. Before you disapprovingly dismiss the Bon 84-203 with a wave of your hand, consider that its simplistic, humdrum appearance completely belies its straightforward functionality. It features a distinct green color that should be easy to spot but what stands out, besides the conventional, simple design is the spectacular longevity. Even in the absence of bells and whistles that only work to inflate prices, the performance of this lawn roller will leave your mouth wide open. And here’s why. With dimensions of 24 by 18-inches, the Bon 84-203 is optimized for rolling small to medium-sized lawns. The compactness of its profile makes it remarkably easy to control and navigate around tight spots and hard-to-reach spaces. With the drum full, it boasts considerable heft for effortlessly and easily levelling the lawn, enabling to grow quickly and healthy. Because this is a manual lawn roller, the likelihood of suffering hand fatigue or strain is considerably high, especially for homeowners who’ll be working for hours on end. To eliminate that possibility, the manufacturer conveniently incorporates an ergonomically designed, user-friendly handle. To make it durable and reliable, the Bon 84-203 features high-end construction with industrial-grade welded steel. That partly why it’s capable of withstanding the rigours of levelling lawns with bumps and several other obstacles and debris. Like other models, there is a heavy-duty horizontal bar above the drum for stopping the accumulation of dirt, mud and other debris, allowing you to work quickly with minimal hiccups. Further, because it weighs a paltry 40 pounds when empty, it’s easy to keep away when it’s not in use. It may not be budget-friendly but the remarkably quick and hassle-free performance you get in return compensates for that. And going by the old adage, good things don’t come cheap. Or something along those lines. For the value-conscious homeowner keen on getting the best value for their bucks, the Bon 84-203 is a solid choice. 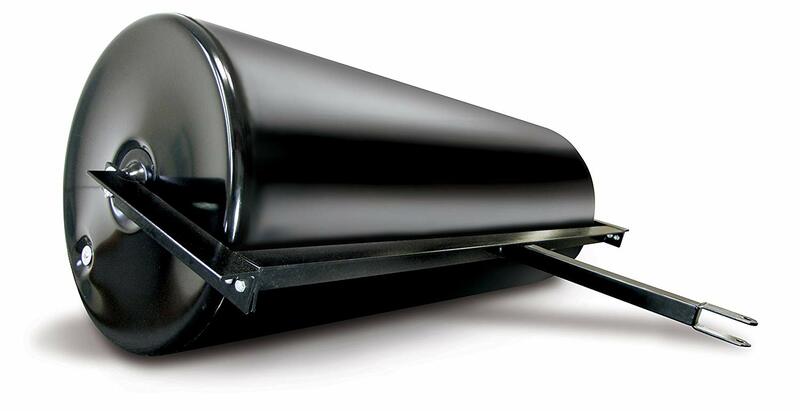 It easily outperforms and outlasts most of the lawn rollers within its price range. In all honesty, only a handful of options on the market are capable of handling the arduous task of levelling tough soils. Most lawns have tough, rocky soils and for the vast majority of lawn rollers that can’t stand some serious beating, everything gives after just a few uses. If it doesn’t crack, they’ll suffer serious dents after a month of use. Luckily for you, we have built to last more than a lifetime of extreme. As well as featuring an all-steel construction, this Goplus roller offers the user a lot of convenience and versatility. Storage and transportation is a breeze, it's easy to fill up and empty, while the ergonomically designed handles provide for effortless and easy maneuvrability. The durability of this lawn roller easily stands out. The fact that the drum is forged from pro-grade steel gives it the requisite ruggedness, resilience, and strength to stand up to loads of attribution for years on end. It's similarly rust- and corrosion-resistant. Rolled round edges ensure effortless and efficient lawn rolling and it's capable of sharp turns without nabbing the growth of your grass in the bud - literally. As for performance, you'll relish the ease, speed, and efficiency with which it flattens and tightly packs loose, even ground. The drum comfortably accommodates up to 16 gallons of water, providing enough heft for tough and most uncooperative lawns. Another signature feature is the comfortable, ergonomically designed handle that allows you to either push or pull the lawn roller with lots of ease. The drain plug is adequately wide to allow for the quick filling and emptying of water. Once empty, the drum weighs a paltry 20 pounds for quick, hassle-free storage and transportation. It’s a feature-rich machine for sure that will help you keep your lawn healthy, properly levelled, and attractive. Mole hills, frost heaves, and heavy soil are an impediment to a levelled, healthy, and picturesque lawn, which is every homeowner’s dream. If you have an average-sized lawn and are looking for an effective, quick, and painless way of getting rid of all three, check out this Brinly PRT-36BH Lawn Roller. The lawn roller is 36 inches wide and has a 24-inch diameter. 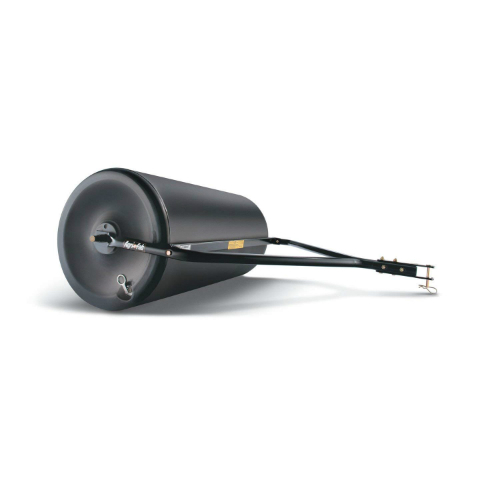 To these add the high-quality, all-polyethylene constructed drum with an outstanding capacity of 690 pounds. Capable of accommodating up to 76 gallons of water, the roller rolls with remarkable ease, efficiency, and maneuvrability, enabling you to complete an otherwise arduous task without ever breaking a sweat. The Brinly PRT-36BH outshines the vast majority of optionss on the market when it comes to efficiency, ease of use, and durability. While it can’t hold a candle to our previous pick, for average-sized lawns and properties, it easily proves its mettle. The 36-inch rolling width and the accompanying 24-inch diameter covers large swaths of the lawn quickly and in fewer passes, helping you considerably cut down the time and effort it takes to complete a lawn rolling project. The large diameter filling opening allows for quick and easy filling and draining of water or sand. Unlike cheap, run-of-the-mill models mushrooming everywhere every day, it doesn’t prioritize performance over quality. It pulls no punches to ensure your product provides you with several years of trouble-free, straightforward performance. The construction of the drum with top-of-the-line poly is adequate quality assurance. You then proceed to subject it to heavy, extreme use on a regular basis and you won’t have to ever deal with a crack and unsightly dents on its frame. With a 24-month warranty, your back is generously covered against deficiencies in material and workmanship. The PRT-36BH is what industry inside call a workhorse. It makes it remarkably easy and quick to erase the damage moles and frost heaves cause to the lawn in addition to helping you pack down loose earth as well as newly sewn seed or sod, leaving your lawn neat and attractive. Aside from the 390-pound capacity drum, the Brinly PRT-36SBH doesn’t have any particularly distinguishing features. However, in a market filled to the brim with flimsy, run-of-the-mill options, this tool stands out in a lot of ways. The 36-inch rolling width enables you to cover large swaths of the lawn is considerably short time while the attendant weight does an amazing job rolling new sod and removing frost heaves. There’s also the durable construction, of course. Boasting an impressive 390-pound capacity, the Brinly PRT-36SBH is all you need to roll out new sod, pack down loose soil, or press seed. Whatever the use, the high-capacity drum ensures your lawn grows smoothly, considerably quickly, and evenly. Capable of holding up to 42 gallons of water, the lawn roller allows you to work for hours on end, only stopping when the results are to your heart’s content. 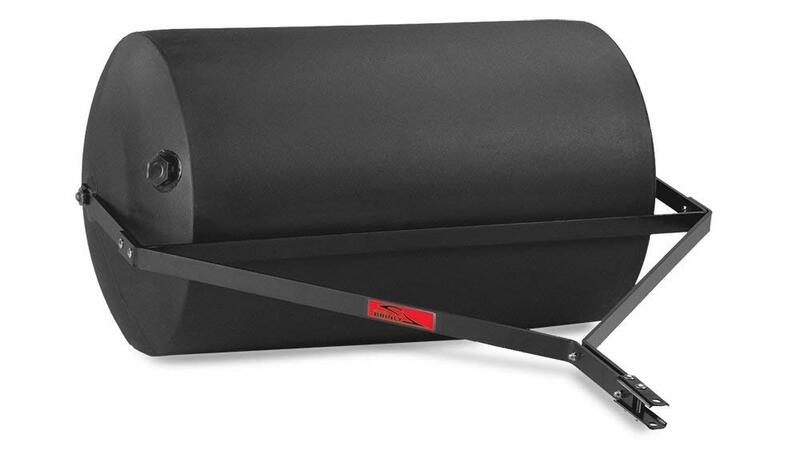 The drum's 36-inch width translates to quick and easy performance while the 18-inch diameter makes it a perfect choice for quickly and effortlessly hooking it to a lower horsepower lawn tractor. As for construction, it isn’t any different from its other siblings. It also comes with a long-lasting drum with rounded edges. As a result, not only is it easy to maneuvre around tight corners and tight spaces but it also won't dent, rust, or damage your lawn. Filling and emptying it with water is a walk in the park, thanks to the extra-large diameter filling opening. It hooks up to a tractor or mower with ease, which is more than you can say for some units masquerading as lawn rollers on the market. It doesn't weigh as much as other models when empty so you can easily store it in between uses. This is a versatile machine designed for light- to heavy-duty applications. Whether it’s erasing lawn damage, packing down loose soil, or just levelling the lawn, it’ll always suffice. This is yet another high-quality behemoth from Ohio Steel, a renowned industry leader. 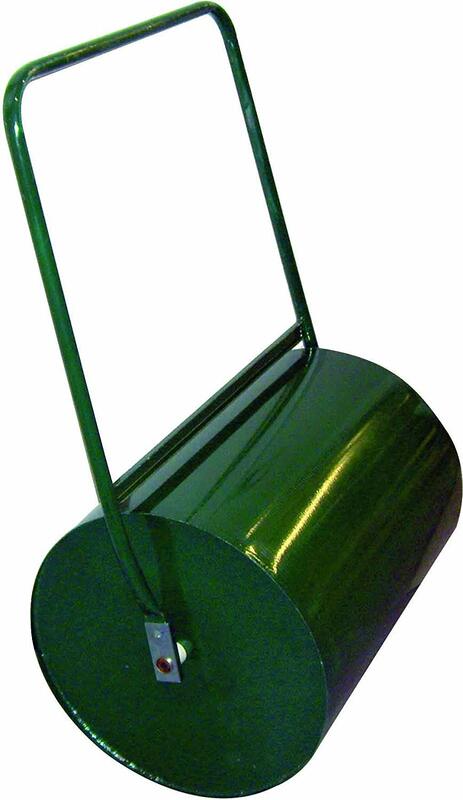 With a mind-blowing 1150 pound capacity drum, it effortlessly applies immense force to the soil, levelling it effortlessly and in a fraction of the time it takes cheap, humdrum models out there on the market. 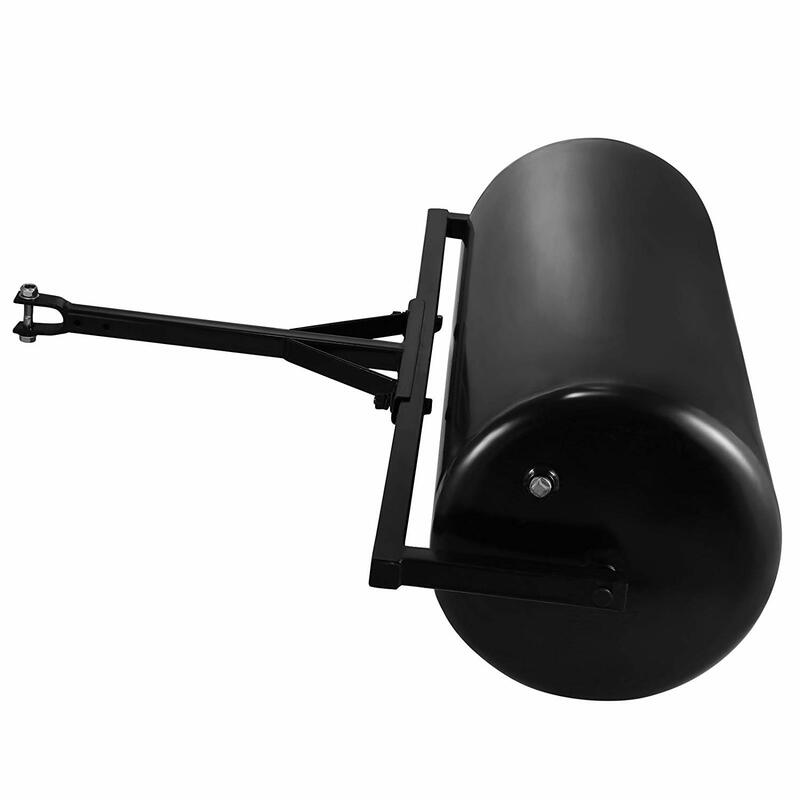 The high-end, durable construction of the drum allows it to withstand tough, rocky soil. Suitable for expansive lawns, it will leave your lawn soil tightly packed together, levelled, and completely free of bumps. Keep in mind that Ohio Steel 60T is specifically designed and optimized for maintaining and levelling huge lawns, a fact that’s reflected in its size, construction quality, and performance attributes. The drum, for instance, comes with an immense capacity of 1150 pounds, ideal for flattening the toughest and most expansive terrains, getting rid of bumps and tightly packing your lawn soil in a single pass. With a width of 60 inches, the machine works almost at twice the rate of standard lawn rollers. Obviously, with an 1150 pound capacity drum, any attempts at pushing or pulling it around the lawn will be futile. It’s for this reason that it comes with heavy-duty towing brackets for quickly, firmly, and conveniently hooking up to your tractor’s drivetrain. In spite of the huge capacity and rugged, fastidious construction using first-rate steel to ensure durability, the drum has rounded edges for effortless maneuvrability around obstacles and other whatnots. The heavy-duty drain plug helps keep water in as you roll the lawn and hit bumps. Speaking of construction, all the stress points are tightly sealed to prevent water leakage. The manufacturer highly recommends adding Ethylene Glycol Anti-Freeze with the water and draining the drum should temperatures dip below 32 degrees Fahrenheit. These measures aim to extend its lifespan by several years. For homeowners with expansive lawns that need levelling, the Ohio Steel 60T Pro Steel is your best bet. 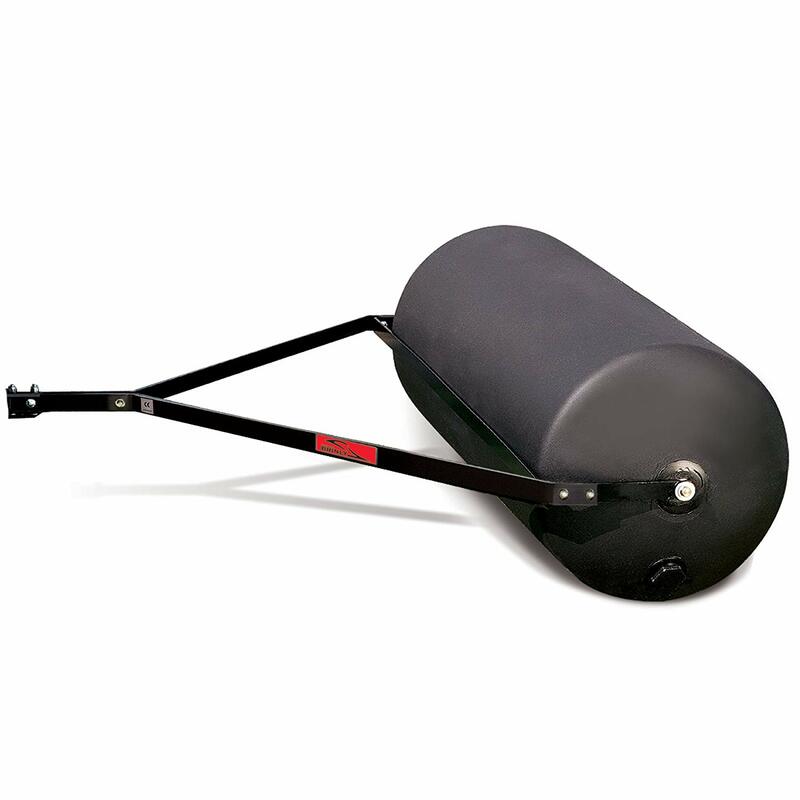 With an 1150 pound capacity drum, rugged construction, and heavy-duty towing brackets, it'll enable you to cover large swaths quickly and easily. This refers to the weight and size of the device. Lawn rollers come in a variety of sizes and their weights vary vastly, a fact that debunks the misconception that there is one best lawn roller. For expansive lawns, a wide option is ideal because of the attendant efficiency and speed at which it covers large swaths in relatively fewer passes compared to its smaller counterparts. Compact options, it goes without saying, are optimized for rolling small- to medium-sized lawns. Regarding weight, the general rule of thumb is the heavier the better. A heavy lawn roller not rolls more efficiently with a wide coverage but also packs the heft for tightly packing loose soils. The vast majority are made from either steel or polyethylene, each, of course, comes with its fair share of likeable and dislikeable attributes. The resilience, durability, and strength of steel are admirable not to mention the added heft that provides for more efficient and effective levelling. On the flipside, steel options are expensive and the material is highly susceptible to rust, which then necessitates great care and maintenance. Poly, on the other hand, comes with the advantages of reasonable sturdiness but obviously can’t hold a candle to steel. 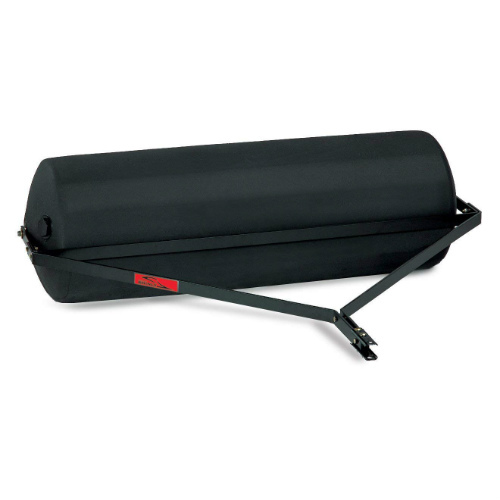 Also, it’s lightweight for easy maneuvrability and transportation and costs a fraction of steel lawn rollers. Plus, it’s exceptionally rust-resistant. Obviously, you’ll be purchasing lawn roller with an empty drum that you will have to fill with either water or sand to give it the requisite weight for levelling different lawns. The effectiveness of water in adding weight and heft is undisputable. Also, compared to sand, water is easier and cheaper to source and the fact that most drums have filling holes that are compatible with a standard garden hose only simplifies things further. However, unlike sand, water increases susceptibility to rust which then forces you to empty the drum after rolling the lawn. Depending on the size of your lawn, you can either choose a push/pull or tow-behind lawn roller. 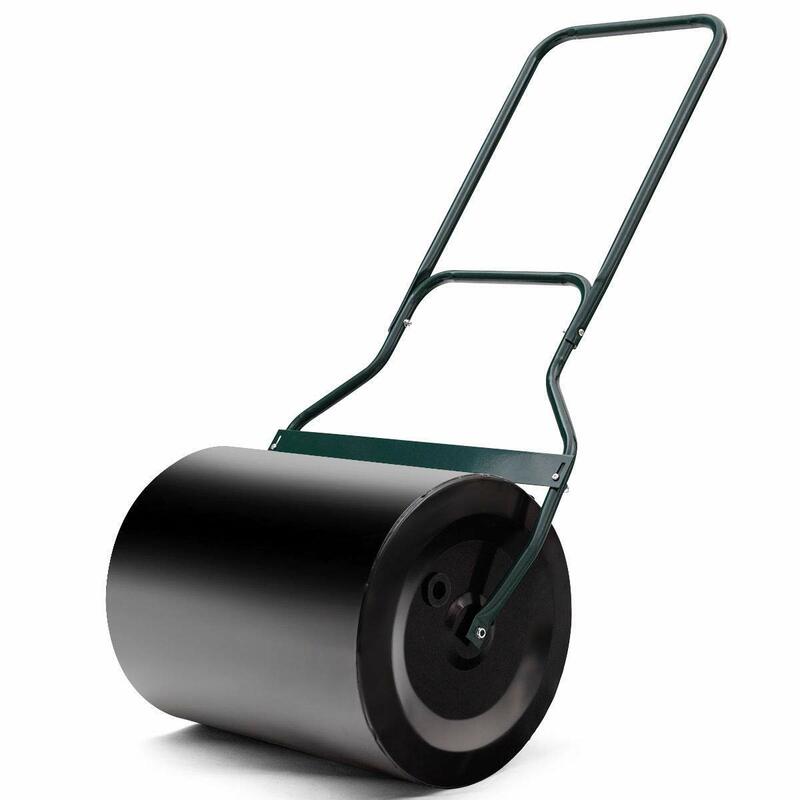 Push rollers are perfect for small gardens and are remarkably easy to turn or manoeuvre around obstacles. They’re similarly affordable and simple but are physically demanding. Tow-behind lawn rollers, on the other hand, work quickly and almost effortlessly while efficiently covering large swaths of the lawn. They’ll spare your body lots of strain and fatigue. However, you won’t have an easy time transporting or storing them as you have to empty them first and manually push or pull them to a safe spot. Q: Is there a specific type of sand to use with my lawn roller? A: Not really. However, kiln dried sand comes highly recommended as it’s finely coarse and dries quickly. As a result, it won’t be much of a struggle filling the drum with it. Q: When is the best time to roll the lawn? A: Rolling the lawn when the grass and soil are a little damp is more effective than when it’s dry or has too much water. You don’t have to wait for a light shower though. You can quickly lightly sprinkle it. Patently, keeping your lawn even and free of bumps, mole hills, and frost heaves takes lots of time and patience. With the right lawn roller though, you make it considerably easier. Luckily for you, our list features only the best options the market has to offer. They’re sublime, cost-effective, durable, and guarantee quick, smooth, and effective levelling all year round. If you haven’t picked one out already, this would be a perfect time.